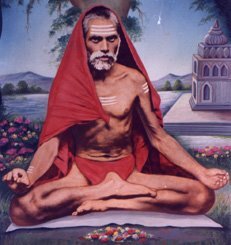 Born in 1854 AD, Sri Vasudeva Shastri, who was later to be known to his followers as Sri Vasudevanand Saraswathi, led an ordinary householder's life before he turned completely to spiritual life. As a householder, he led a rather difficult life, owing to the disputes between his wife and mother. As he turned to spiritual life, he made rapid progress and received direct guidance from Lord Dattatreya. Shri Govind Swami whom he met at Wadi acted as his guide and mentor during these testing times. After his wife's death, he renounced the worldly life completely and went to Ujjain, where he was initiated into monastic life by Shri Narayananand Saraswati, who also gave him the title of Shri Vasudevanand Saraswati. The Swamiji spent the next 23 years of his life in the service of Lord Dattatreya, traveling to various parts of the country by foot and propagating the Vedic ideals.